That remarkably honest comment was made last month by Amy Walter, national editor of The Cook Political Report, at a conference I was part of in Washington. The election expected to be dominated by big money is instead so far dominated by an unlikely and seemingly unelectable set of outsider candidates Walter said the pundits are at a loss to explain this. That’s honest too. Why can’t the punditocracy tell what’s happening? Because this election is being fueled by something well beyond politics. These three charts from in Ad Age’s annual marketing data report, explain the reasons for WTF politics missed by the chattering classes. In terms of annual income, the US economy has been headed in the wrong direction much of the last two decades. In aggregate, there’s a clear downward trend. However, the real power of this data is in its segments. Looking at the economy in fifths based on income shows this story in greater detail. Since 1970 the portion of wealth held by each segment of the US economy below the richest fifth has contracted or flat-lined, while that single top fifth has expanded. The more distant a slice of the economy is away from the richest fifth, the more income they’ve lost in recent years. Others can try to explain why this is, and those causes no doubt could span the political spectrum. Instead of looking at the causes, let’s look at the result. The ends of the economy area headed in different directions: The bottom 10% of earners, who have an annual household income of $12,000, have seen a 5.3% drop in hourly adjusted wages over the last 34 years. But since 1980 the top 1% of earners’ wages has increased by 137%. Today the top 1% of families receive 22.5% of all pretax income, while the remaining 90%, for the first time, have less than 50% of it. The wealthiest 160,000 families own as much wealth as the poorest 145 million families combined. We’ve heard about towering CEO pay for a long time now. In1989 the average CEO earned 58 times the average earned by their workers. That was worrisome even back then and now that number has risen to CEO’s receiving 295 times the pay of their average staff member. Meet the Great Gatsby Curve. “Some degree of inequality in income and wealth, of course, would occur even with completely equal opportunity because variations in effort, skill, and luck will produce variations in outcomes. Indeed, some variation in outcomes arguably contributes to economic growth because it creates incentives to work hard, get an education, save, invest, and undertake risk. As the top slice of the economy has wealth, the bottom half has accumulated structural debt. Last month, the Government Accountability Office found the number of senior citizens still paying off student loans has quadrupled since 2010. Can you belief there’s a group of people over 75 who are carrying student loans. It’s hard to imagine a more tangible embodiment of structural debt. Education is coming at an increasingly higher price to the 61 million families in the bottom half of the economy, where the level of educational debt being carried is approaching the value of a full year’s income. 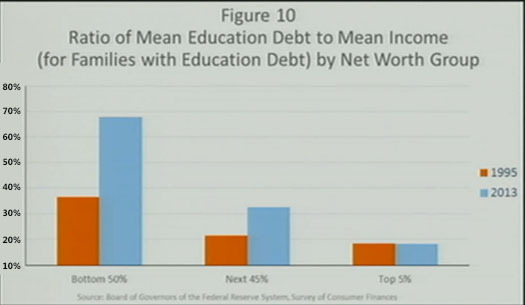 This chart from Yellen’s presentation shows that this ratio of educational debt to income more than doubled between 1995 and 2013. So, we’re seeing that many families now have little or no wealth, declining income, and growing a level of educational debt. The combination of these forces leaves families more stressed than ever. A few weeks ago 10,000 families in Boston applied for just 73 low income rent vouchers. Twenty-five% of people in my city, Boston, spend half their income just on housing. Nationwide there are 11.8 million households doing the same. Are you seeing the same picture that I am? A large part of our culture is in a financial vise while a smaller group is experiencing success and far higher levels of self-determination. It shouldn’t be a surprise to anyone who can see past their own income bracket that voters are angry. But they could be a lot angrier, because at the moment Americans actually imagine wealth inequality to be less than it is. It is difficult to say what would happen if the public perception ever catches up to the financial reality. Perhaps the best closest period in history would be the radical agitation on the Left and the Right that came following the Great Depression. 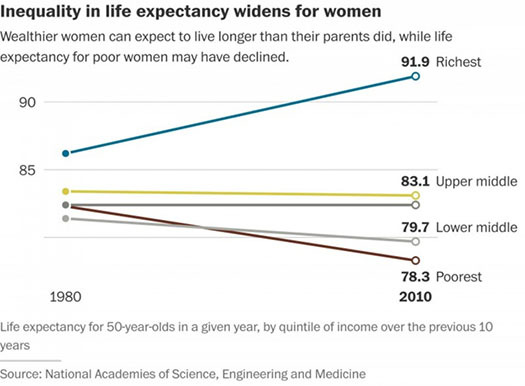 While preparing a conference talk about innovation in healthcare, I came across an astounding Washington Post article: The stunning – and expanding – gap in life expectancy between the rich and the poor. The article covered a report requested by Congress and published by the National Academies of Sciences, Engineering and Medicine. Since people in the US on average are living longer, researchers were asked to consider the economic effect of raising the retirement age. The surprising finding was that this would focus the benefits social security disproportionately to the rich, as the increases in life expectancy have been concentrated to the wealthiest fifth of the economy. Peter Orszag, one of the chairmen of the committee that wrote the report told the Post, “The bottom of the socioeconomic distribution isn’t experiencing any material increase in life expectancy.” Men born in the 1930’s are dying in a normative pattern across income groups, but the research suggests those from born in the 1950s and 1960s are not. The reality of this inequity hit me hard as I worked on that talk for the health innovators. My mom was rich for part of her life, but she also had times of low income. While I went to high school she had second jobs that included renting shoes at a bowling alley and likely being the worst liquor store employee ever, as she was a non-drinker who was fine that others should do as they please. She died relatively young, and somewhat spectacularly had saved multiple times the value of her home in order to make substantial gifts to community organizations. She was fiercely conservative, but emotionally invested in the fairness that a level playing field for all provides. Libraries were a big focus of her gifts, as she felt they were needed most where people were poorer. The problem is that there comes a point when The Great Gatsby Curve and level playing fields become mutually incompatible. My mom lived a hard life; perhaps we all do – but when patterns of inequality start to define life’s potential and duration, then inequality takes on a moral dimension. It challenges business to stand for something beyond earnings and CEO compensation, and customers who have received fair value. The causes of this inequality in health and wealth are complicated. But that doesn’t lessen their reality, or the dynamics that will play out as these changes are resisted and reinforced in the future. New facts will accumulate, and as narratives are established which explain this change. And that brings us back to voters. Eight years ago we elected a president who, we were assured, would be a bringer of change. Two years later voters on the right demanded even more change. They elected a slew of sharply conservative legislators and threw out some they didn’t consider nearly conservative enough, allowing the GOP to retake both houses of Congress. Despite all these demands for change the economic reality remains the same and headed the wrong way for the majority of Americans. From this voters at both ends of the political spectrum have drawn a non-obvious conclusion. It’s not that conflicting changes cancelled each other – but that the political system can’t be counted on to respond with the transformative changes voters seek. When Donald Trump or Bernie Sanders says the other candidates are “bought and paid for” that rings true to many people. It’s not just those at the bottom of the Gatsby Curve who see dozens of ways that economic influence means greater and political influence. The popularity of a class clown and a Socialist who are seen at truth-tellers should tell us something: People are very unhappy and have lost faith in the Establishment. What will it look like? Likely more initiatives to address the pinch points of privilege like LAX’s airport terminal for celebrities. These will make the separation between the two sides even more obvious to all. Whether that is a good or bad thing depends on which end of the economy you occupy. But until we recognize the dynamics of this two tier existence, WTF moments will continue. Sorting out how a bifurcated culture can come together will let us know if e pluribus unum is still one of our ideals or words in a forgotten language on our spare change. 3 Responses to "WTF Politics: Trump, Sanders and Frustration in America’s Two Tier Economy"
OK Dave… You inspired me to take my head out of the sand… Now what!? Glad to see your response, as you are a natural distributor of big ideas. I suppose the first step is exactly what we’ve just done, starting to look at the world to get a handle on this that others can grab on to — because it will take lots of small changes and bigs ones to improve this. I brought this thinking to a client who accepted it as provocative reality in their consumer’s lives, which could affect how they develop and prsent their services. Small steps in the right direction are encouraging — and finding models for change can show this is a choice. Machiavelli said that change is hard because the beneficiaries of the present have all its resources, while the beneficiaries of the future are neither as certain or advantaged. But, once that intertia is overcome, the momentum of even small changes can sweep bigger onces forward. “Changers Wanted”….Looking forward to talking w/ you more.